The Amberg Historical Society is a nonprofit volunteer organization affiliated with the Wisconsin Historical Society. It is dedicated to the preservation and interpretation of Amberg History and the immediate area. This area consists of several extinct communities including Argyle, Cedarville, Martindale, Phillipsburg, and Taylor Rapids. The Society also collects information about the settlement known as White Rapids. 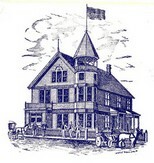 The Amberg Historical Society formed in 1983 from the efforts of the Amberg Centennial Committee. The committee consisted of twelve volunteers who collected photographs of pioneer settlers. These twelve committee members became the founding members of the Society. The Town of Amberg offered the use of the abandoned fire department building and soon it was filled with artifacts donated by interested community members. In 1989 the historical society moved a four room house to the museum complex and with the help of numerous volunteers, classes from the Amberg Grade School, and local businesses and organizations the Society restored the house. This project called the "Turn-of-the century" house was given the Hometown Pride Award by Midwest Living magazine (“Hometown Pride Honor Roll", Midwest Living, October 1990). Other buildings that were moved to the complex for preservation by the society include the original Amberg Depot and the Cedarville station. Volunteers also moved and erected the complete derrick from the Paveglio Quarry. In 2005 the town of Amberg authorized the Amberg Historical Society to include the original Amberg Town Hall to the complex. The building was constructed in 1894 and is on the National Register of Historic Places. The Amberg Museum is owned and partly maintained by the Town of Amberg while the Society preserves the collection and operates the museum complex. The Society also cooperates with the town in maintaining an updated list of burials at the Amberg Cemetery. In an agreement with the town, the Society does not charge any entrance fees. It operates entirely on donations, membership fees, and fund raisers. In 2008 the society became a nonprofit organization and became an affiliate with the Wisconsin Historical Society. The Society also maintains membership with the American Association of State and Local History (AASLH).